Built in 1691 this unique „Engadiner“ farmhouse offers exceptionall accomodation, well off the beaten track. Thanks to the careful renovation by the current owners, the Ganderhaus is the ideal spot to get away from it all and recharge your batteries enjoying a comfortable and relaxing time in the swiss alps. The arched entrance way leads directly into the spacious reception hall „sulèr“. Leading off from here you will find the roomy kitchen with large dining table, built-in wooden bench seating and a wood-burning stove.The cozy panelled living room with original stone oven feature is warm and relaxing, perfect after the days outdoor activities. Upstairs the accommodation comprises 3 generous double bedrooms: the first is wood-panelled with 2 single beds, the second features a queensize bed with an antique daybed in the anteroom and there is a further large twin bedded room with it`s own sink. On this floor there is a family bathroom with shower and toilet as well as a separate WC. Our holiday in the Ganderhaus was absolutely fab. The house itself is almost a museum because of its authenticity but than with the cosy feeling of a real home. The owners go out of their way to make sure you're settled and comfortable. This is a place for peace and quiet , for enjoying nature but also the vicinity of the great rhaetian railway system. More lively towns like Chur and Sankt Moritz are within an hour's drive. All in all, a true gem. where we had a great holiday. We stayed at the Ganderhaus in Stugl/Stuls for one week this August. We were 6 people: 4 adults and 2 small children. We were welcomed by the very nice and helpful owner and his son. This is a very beautiful and spacious chalet with lots of rooms on different floors and all the comfort and amenities we wished for. It's located in a tiny village in a beautiful valley leading to the Albula pass. The picturesque Bergün is conveniently close by (10 min. drive) for grocery shops, café's and restaurants. It's great fun to take the train on a very adventurous track to St. Moritz. We enjoyed the many hiking opportunities around, to the mountain huts and glaciers nearby (Piz Kesch, Piz Ela) and those within an hour reach by train or car (Piz Palu, Bernina, Morteratsch). On rainy days we enjoyed the hot spring facilities in Alvaneu Bad (20 min. drive) and visits of historic towns in the Engadin! A very memorable week, we'll surely return. Hopefully next year! Wir haben die Zeit in Stuls sehr genossen, das Haus ist wunderschön und die Gastgeber perfekt! Zu viert genossen wir das historische und stilvoll modern ergänzte Denkmal. Die Räume sind enorm grosszügig und das Erlebnis in altem, (fast) wie heute zu Wohnen haben uns viel Freude bereitet. Wir wurden sehr freundlich empfangen und können es jederzeit weiter empfehlen. Ein herrliches Ferienhaus, das Natur- und Bergliebhabern den richtigen Ausgangspunkt bietet: Wanderwege starten vor der Haustuere, ein toller Schlittenhang ist hinterm Haus und von der Gartenterrasse aus hat man ein traumhaftes Bergpanorama. Das Haus ist stilvoll eingerichtet und schoen dekoriert. Man fuehlt sich gleich wie Zuhause, denn es ist alles vorhanden fuer einen entspannten Urlaub (Fondue- und Raclettegrill, geraeumige und funktionelle Kueche, gemuetliche Stube zum Aufwaermen im Winter). Besonders beeindruckend ist die Stille, Ruhe, Einsamkeit und der Sternenhimmel! Wir alle, 2 Erwachsene und 3 Kinder (Alter 3, 6 und 8 Jahre) haben uns sehr wohl gefuehlt, gut erholt und wuerden gerne wieder kommen. Dieses herrliche Ferienhaus fuer Natur- und Bergliebhaber bietet den idealen Ausgangspunkt fuer viele Unternehmungen: Wanderwege starten im Dorf, Schlitten fahren geht schon hinter dem Haus und vom schoenen Gartensitzplatz aus hat man eine wunderbare Aussicht auf das imposante Bergpanorama. Besonders beeindruckend sind die Stille und der Sternenhimmel! Das Haus ist stilvoll eingerichtet und man fuehlt sich angesichts der liebevollen Dekoration wie zu Hause. Die Kueche ist funktionell und geraeumig, die Stube gemuetlich und Dank des Ofens bestens zum Aufwaermen an Wintertagen geeignet. Das kleine Skigebiet im Dorf Berguen ist ideal fuer Familien mit kleinen Kindern. Unsere Familie , 2 Erwachsene und 3 Kinder (3, 6 und 8 Jahre alt) hat die Woche in dem malerischen Dorf sehr genossen. 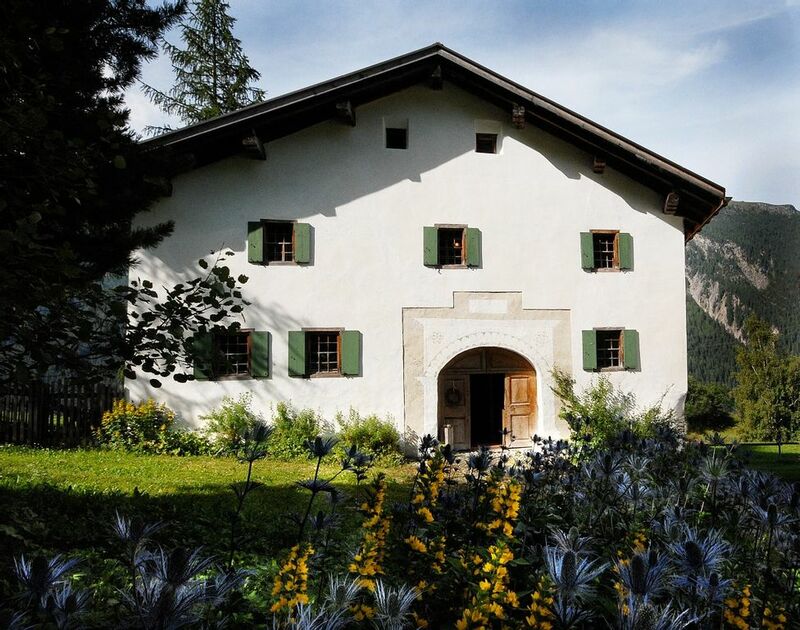 Situated in the midst of the Ela nature reserve at a height of 1551 meters, you will find peace and tranquility in abundance with panoramic views of the Albula valley below. Stuls offers superb hiking right on the doorstep: whether it be a leasurely stroll to the picturesque village of Latch or the somewhat more strenuous alpine hiking in the Sertig/Davos region and the rugged wilderness of Val Tuors and Piz Kesch. Travel onboard the historic Unesco listed „Rhätische“ railway as far as Preda and then continue on foot to the breathtakingly beatiful lake at Palpuogna. Just 15 mins away bus or car at Alvaneu, enjoy a round of golf or revive body and spirits at the Thermal baths with indoor and outdoor mineral pools. In winter try out the world-famous taboggan run at Preda or head off-piste to the virgin powder slopes of Darlux. Whatever it is you decide to do, you are sure to take home some unforgettable memories. We look forward to welcoming you to Ganderhaus, your home away from home. Bett- und Frotteewäsche, sowie Nebenkosten wie Strom, Heizung, Wasser und Holz sowie WIFI sind im Preise enthalten.